TJ TrailGate for Jeep Wrangler TJ 1997-2006. Tired of the limited functionality of your Jeep swing-out tailgate? Do you yearn for the convenience and functionality of the drop-down tailgates from back in the day? Looking to shed a few pounds while gaining a smooth new look for your trail rig? 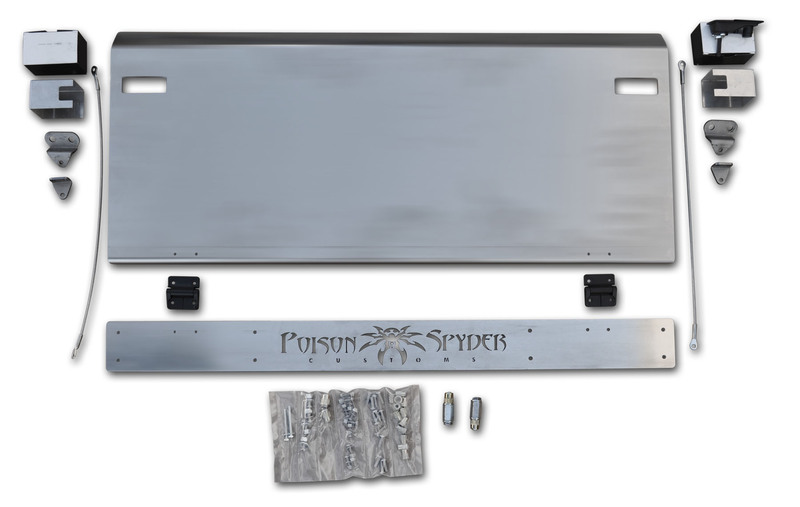 The Poison Spyder TrailGate replaces your Jeep heavy, cumbersome swing-out tailgate with a lightweight, sleek, aluminum drop-down gate and Tramp Stamp. The complete TrailGate kit includes the aluminum TrailGate panel, lower Tramp Stamp heavy duty hinges, locking flush-mount latches, limiting cables, brackets, weatherstrips and hardware. The drop-down TrailGate restores classic tailgating functionality to your Jeep. Use it as a convenient seat at outdoor events, or as a lunch prep table for those stops along the trail. It even works great as a temporary work bench for performing those on-site trail repairs. The TrailGate smooth exterior surface gives the back of your Jeep a smooth, clean appearance, which looks great by itself and even better when used in conjunction with a pair of Poison Spyder Crusher Corners! If you already have our Crusher Corners, you may cover the hinge cut-outs with the optional Tailgate Hinge Delete Covers. The gate panel is CNC laser-cut and precision brake-formed from 3/16 inch aluminum plate. The Tramp Stamp piece is CNC laser-cut from the same 3/16 inch aluminum plate, featuring the Poison Spyder logo across the center. The Tramp Stamp and cable brackets install using nut-serts, which are provided in the complete hardware kit, along with stainless steel button head fasteners. The high quality latches are lockable (keys are included) and sit flush when closed to maintain the sleek profile of the TrailGate. Like the Tramp Stamp but no need for the TrailGate? A non-gate Tramp Stamp is available by itself. This product ships as bare aluminum it will need to be painted or powdercoated prior to final installation. We do Not offer a powdercoat option for this item.